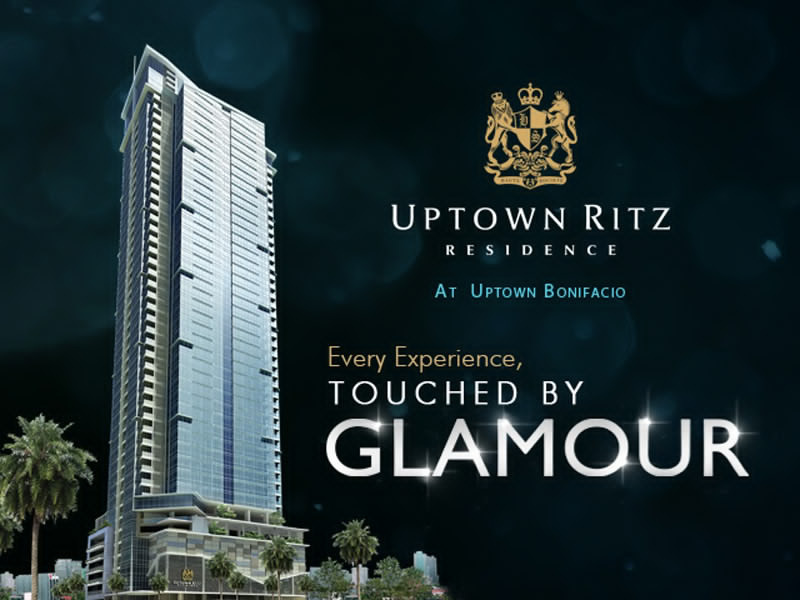 It’s your relentless pursuit of all things glamorous that makes Uptown Ritz Residence your address of choice. Here, all the residences are suites – large, luxurious spaces designed with the kind of style and sophistication that stands out and sets you apart. Rising in Uptown Bonifacio, a live-work-play township in Bonifacio Global City, Uptown Ritz is where unforgettable experiences begin. And it’s where you realize that your life’s finest pursuits have now found a home. With a grand lobby on the ground floor and low-density large units occupying the residential levels, the seventh floor is dedicated to a comprehensive bi-level amenity deck. Here will be found a swimming pool complex with an in-pool lounge and wooden sundeck, bi-level gym and nursery, children’s play area, business center and lastly, multipurpose function rooms fitting for glamorous social gatherings or elite corporate events. This interpretation of modernity is all about the glitz and glamour; it is about the exclusive. Posh living has come to Manila. 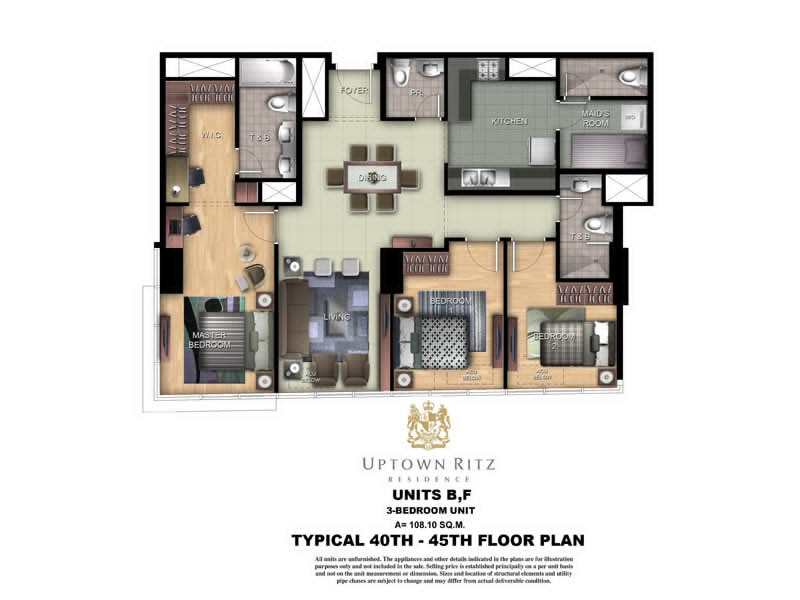 Live large at Uptown Ritz, the metro’s glamorous face of luxury. 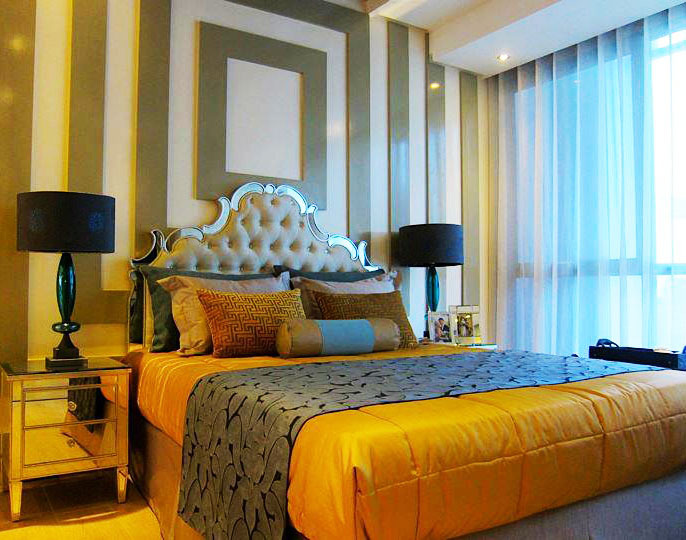 Located at a prime location that makes trips to and from the Makati and Ortigas Central Business Districts seem quick. 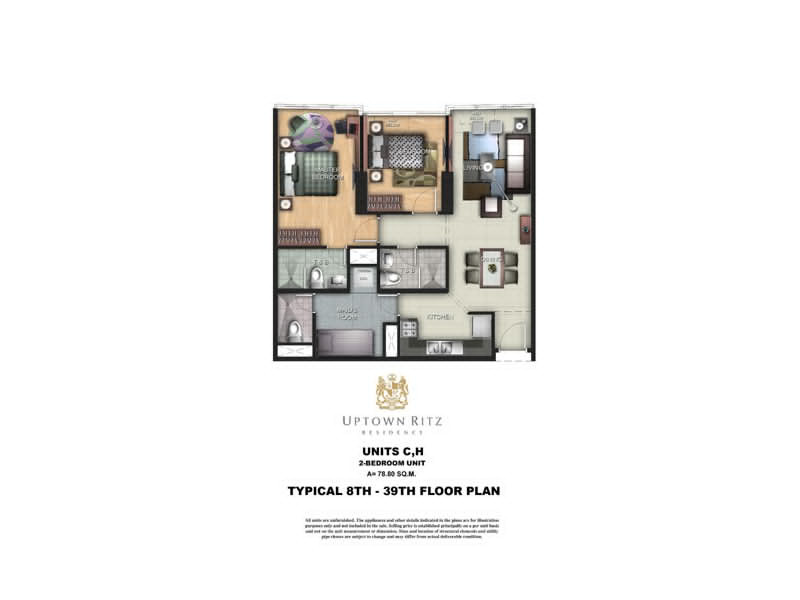 From Uptown Ritz, you have six different access points that can take you anywhere in Metro Manila. Just a short distance from your garage is EDSA and also, C-5, the two major roads in the Metro. You also have roads that will instantly take you to NAIA 3 Terminal, Ortigas, SLEX or anywhere else for that matter. Meanwhile, your children have numerous options when it comes to schools such as International School Manila, British School Manila, and Manila Japanese School which are all short walks away. No more long tiring trips for your loved ones. If you’re looking to unwind,you have hip places like High Street, Serendra, Burgos Circle and The Fort Strip less than 5 minutes away. But the real beauty is Uptown Place, a 3 level modern mall that will rise just across the street from Uptown Ritz. 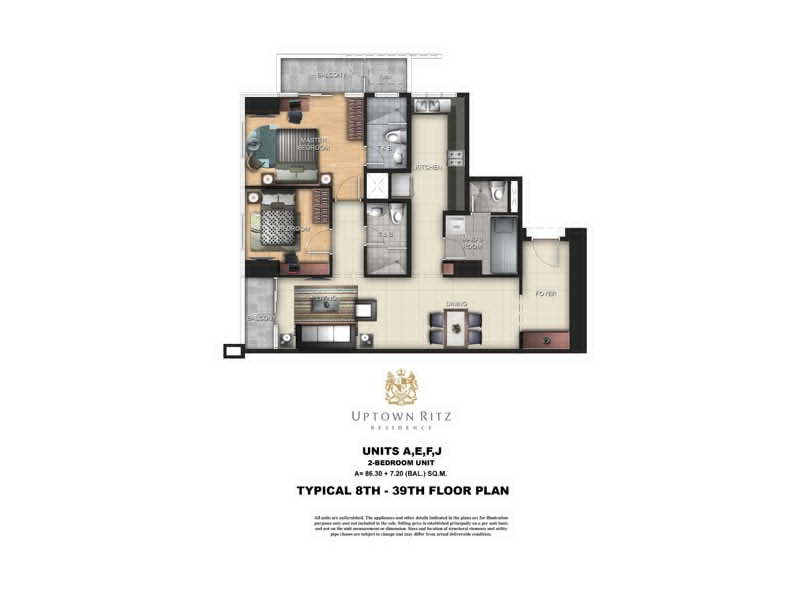 Two bedroom units at Uptown Ritz include a master bedroom with private toilet and bath, an additional bedroom and common bathroom, a maid’s quarters with dedicated toilet, a functional kitchen and a spacious living and dining area with private balcony. 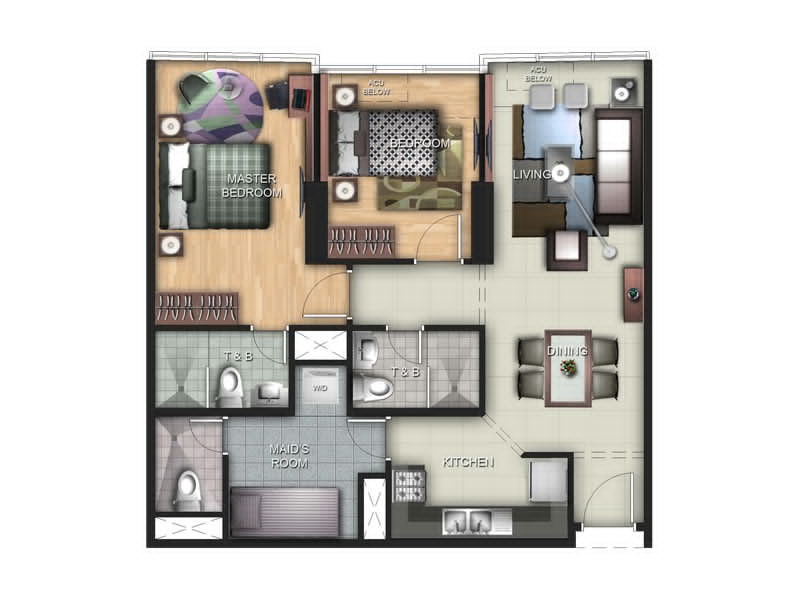 Units range between 78.8 and 93.5 square meters. 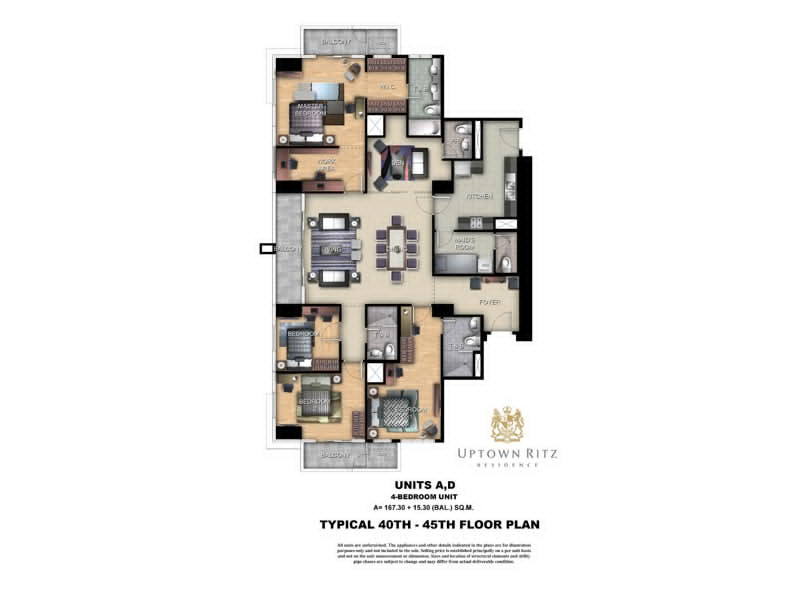 Three bedroom units at Uptown Ritz, spanning 108.1 square meters, are found on the 40th to 45th storeys of the building. The master bedroom includes a walk-in closet and dedicated full bathroom with bathtub. The two other bedrooms share a common bathroom. The unit also includes maid’s quarters, a functional kitchen and a spacious living and dining area. 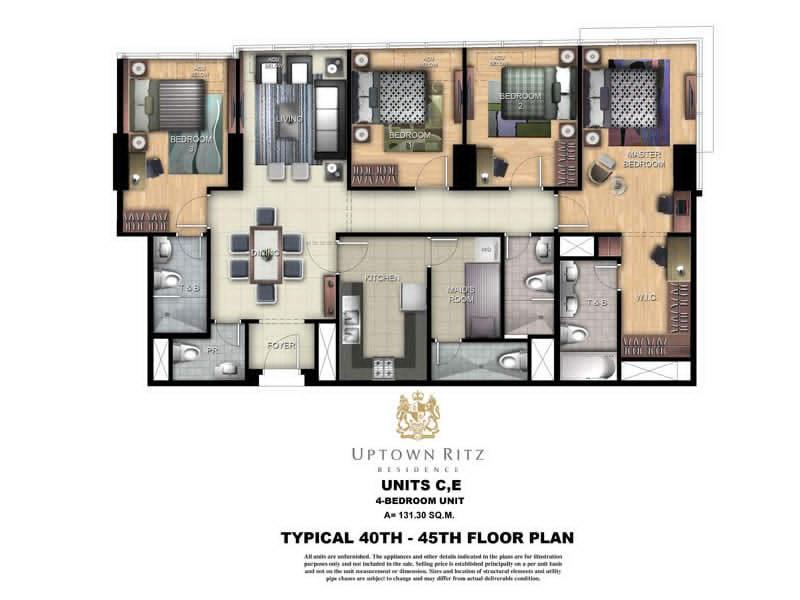 Four bedroom units at Uptown Ritz span 131.3 square meters. The master bedroom includes a walk-in closet and full bathroom with bathtub. 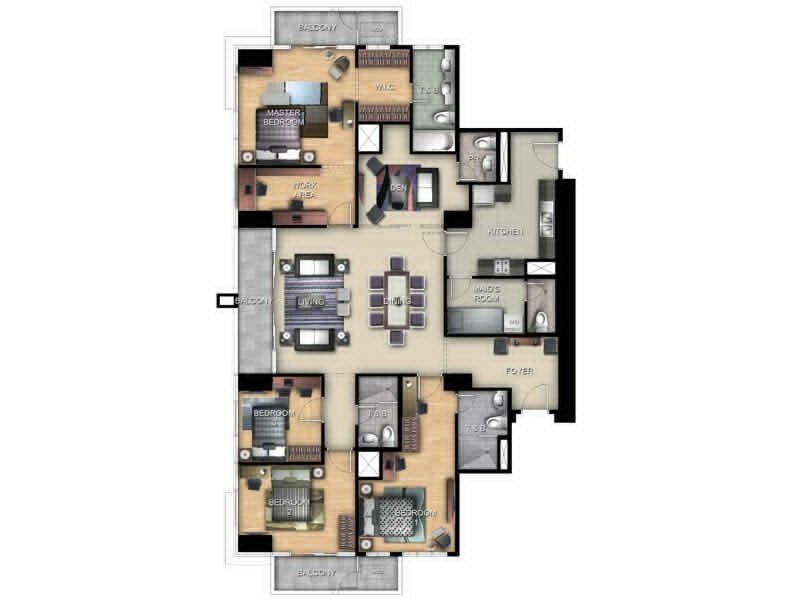 The unit includes a junior suite with its own bathroom and two additional bedrooms that share a common bathroom. The unit also includes a kitchen that is connected to the maid’s quarters with dedicated toilet, and also a foyer, attached to a spacious living and dining area. 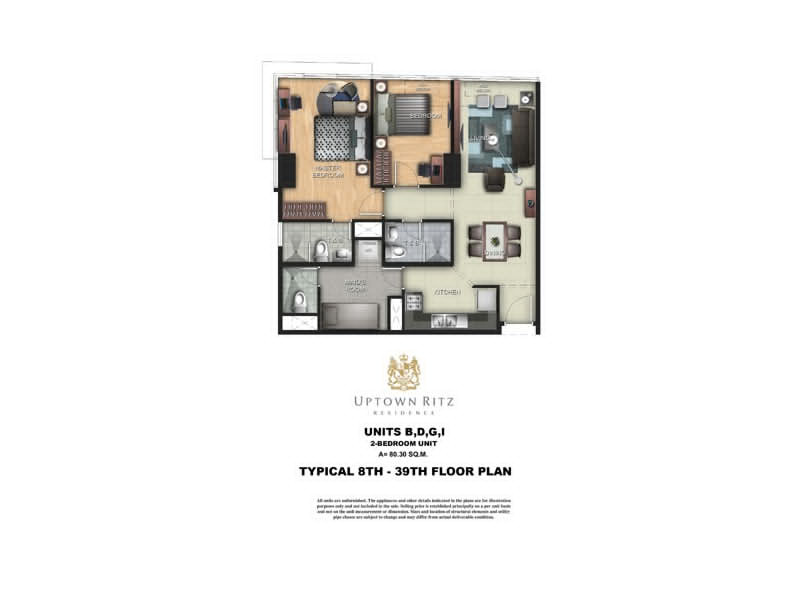 Executive four bedroom units at Uptown Ritz span 182.6 square meters. The master bedroom includes a walk-in closet and full bathroom with bathtub. 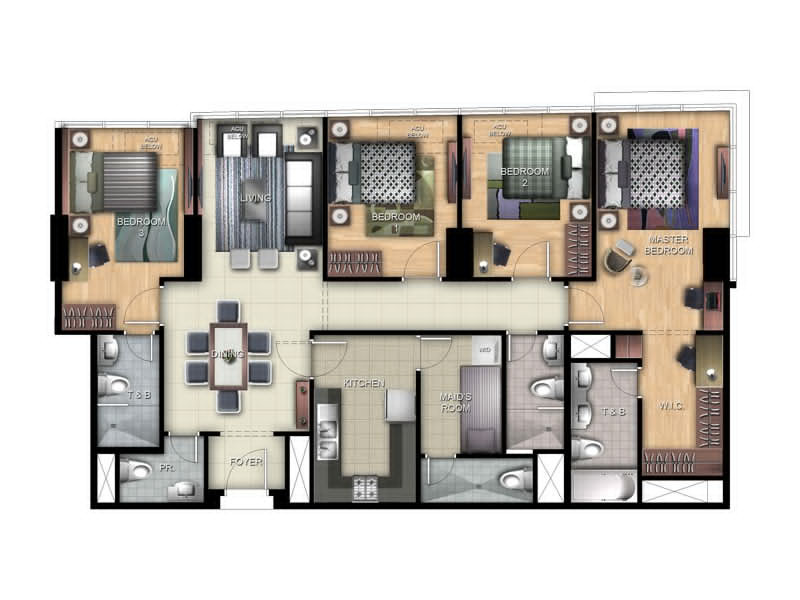 The unit includes a junior suite with its own bathroom and two additional bedrooms that share a common bathroom. 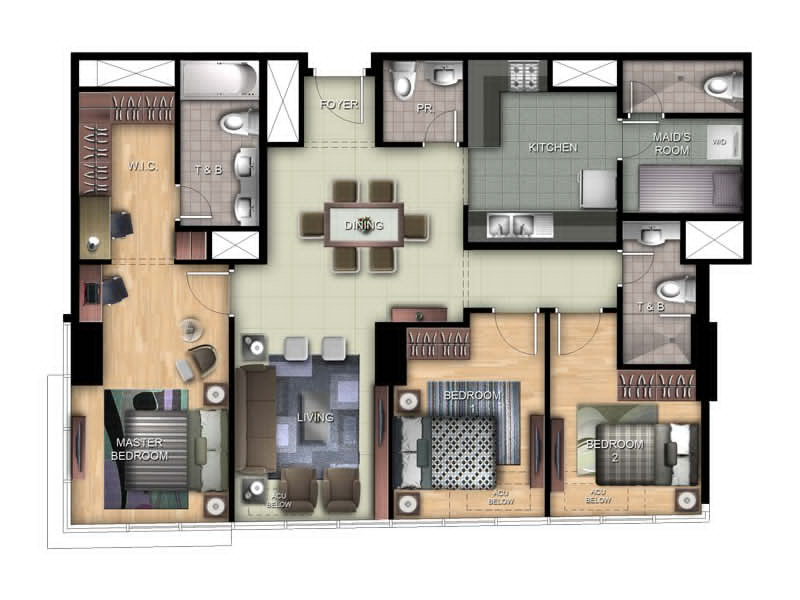 The unit also includes a foyer and den, attached to a spacious living and dining area. The kitchen is connected to the maid’s quarters with dedicated toilet. This unit is differentiated from the four bedroom unit by its three private balconies, attached to the master bedroom, the living area, and two of the other bedrooms. This entry was posted in Global City Projects, Uptown Bonifacio, Uptown Ritz and tagged 2BR, 3BR, 4BR, angela junia, bgc, bgcmegaworld.com, Big Condos, bonifacio global city, British International School, Burgos Circle, condo, Condominium, Condominiums, Dasmarinas Village, For Sale, Forbes Park, Forbes Town Center, fort bonifacio, High Street, International School Manila, investment, Japanese International School, Makati, Manila Golf and Country Club, megaworld, Megaworld Corporation, Ortigas, philippines, preselling, Prime, St. Luke's, taguig, Two Bedroom, Two Bedroom Unit, Uptown, Uptown Bonifacio, Uptown Ritz on March 17, 2013 by Real Estate MNL Author.